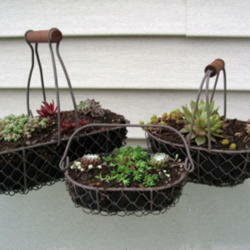 An easy and inexpensive way to get started with sempervivums is to grow them in containers. But that's not the only reason to plant them in containers. 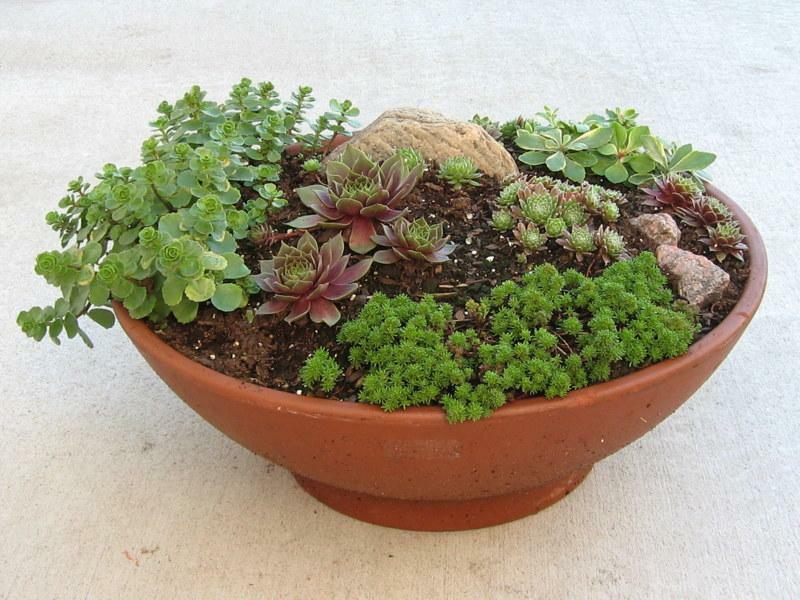 Sempervivums will grow in a smaller amount of potting mix than most plants, so it’s not necessary to use large containers. 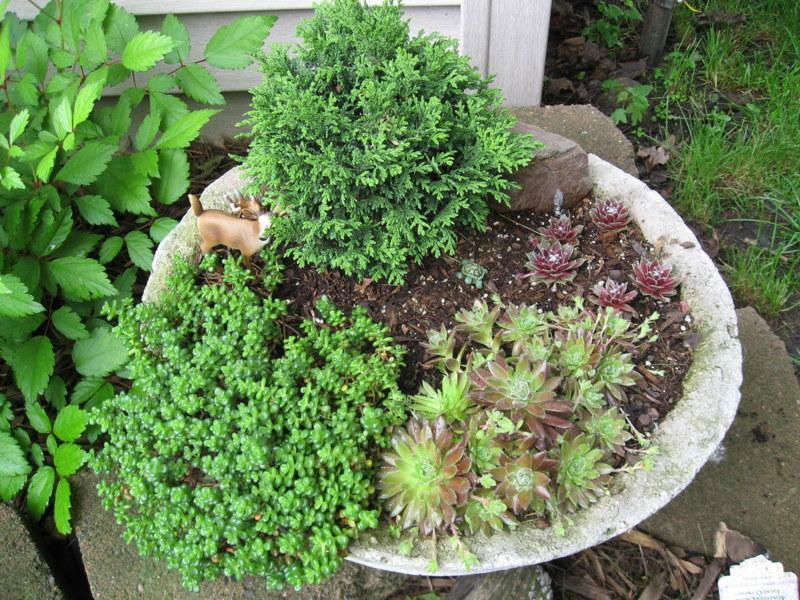 Containers come in an amazing variety of colors, sizes, shapes, and materials, but don’t think you have to plant your sempervivum in a conventional pot. 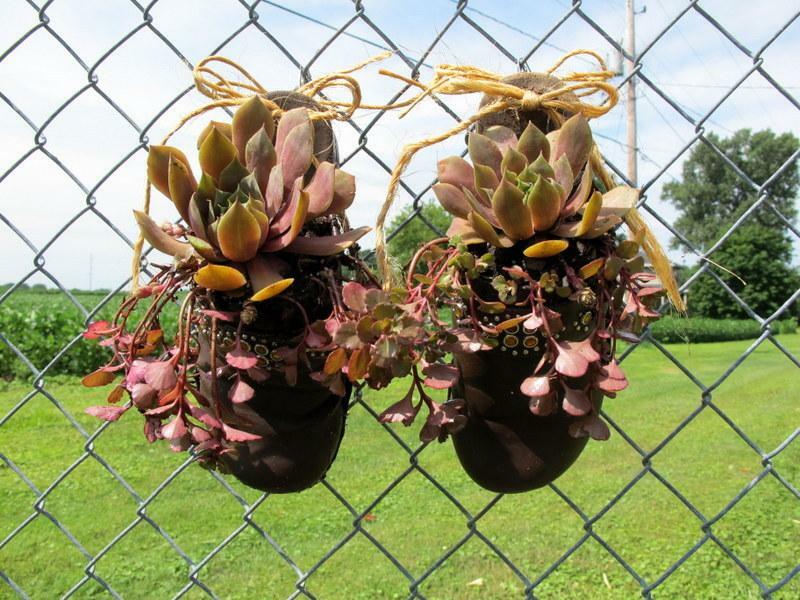 Try old shoes or boots, dishes, topiary forms, in wood, on rocks, and in baskets, old toolboxes, etc. 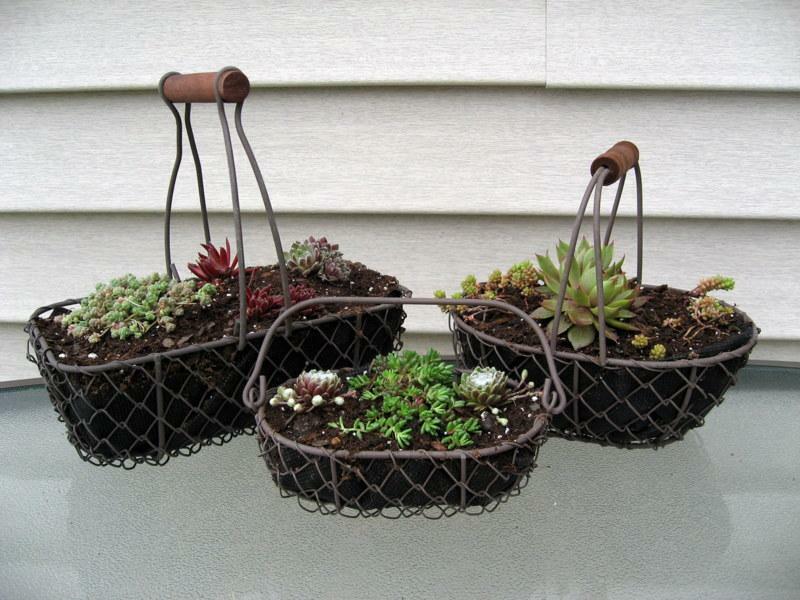 Plastic pots work well too, or build your own wooden containers. A nice thing about containers is that you can just pick them up and move them until you find a spot where your sempervivums are happy. They enjoy being in the sun, but appreciate some shade during the hottest part of the day. Sempervivums come in a wide range of colors, so you can also move your pots as needed to complement or enhance other areas of your yard. At times, you may want to move your containers to get them out of the rain or away from hot drying winds, or to put them in a warmer/drier environment for the winter. I have some sempervivums that don’t do well in the constant moisture from melting snow, so I move those into the garage for the winter. The most important thing to consider when planting your containers (or even if you’re planting in the ground) is to provide excellent drainage. Without good drainage, they will rot. When you plant in containers, it’s easier to create an ideal potting that provides an environment for them to live up to their full potential. 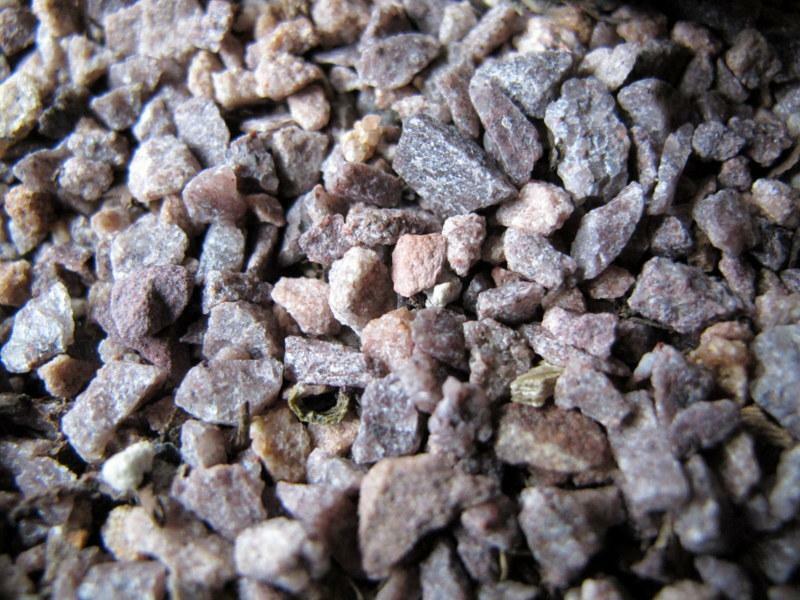 A purchased cactus mix will work if you absolutely can't make your own, but it's not the best choice. It’s easy enough to make your own mix. Your location will determine which ingredients are available for you to use, and which ones will work best for your climate. Sometimes I change the ingredients, depending on what I have available, and sometimes I use the Miracle-Gro with the water beads for retaining moisture. It depends on the location of the container and on the size and type of container. The larger glazed ones retain water longer than non-glazed or smaller containers do. The smaller hypertufa containers tend to dry out quickly here during summer, so I include the Miracle-Gro containing the water beads in my recipe. In the winter I need to give those some protection from the constant rain because of the water-retaining beads. This recipe is easy to adjust to your growing conditions. 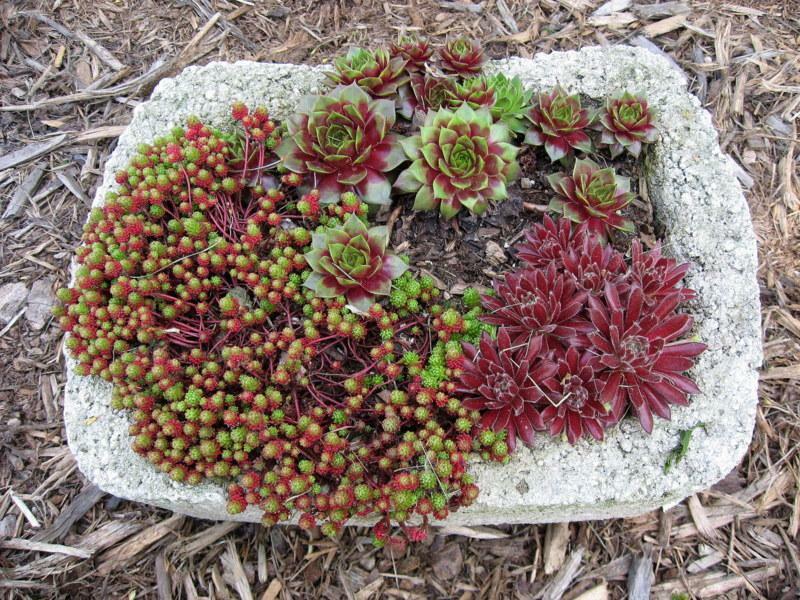 Sempervivums seem to really like the pumice in the mix. Tabby, Colorado, zone 5: I did a bit of research years ago which indicated that semps didn't like acidic soil and didn't do well in peat. Also, I noticed that the semps which were planted straight into my sandy clay alkaline soil did quite well. So, I use a mixture of my own backyard clay soil, mixed with sand and perlite to give it more drainage. The clay holds the water, which is actually not a bad thing in this dry climate. I can water the pots once every week or so in the hot weather and they do fine. The hypertufa breathes from the sides and wicks the water so the roots don't drown. This soil doesn't wash out of the pots if we have a horrific driving rain, but I doubt that it would work well in a wetter climate. serse, Tennessee, zone 7a: My most recent combo is nothing special, but so far it has worked well! It is very light and drains well, but it still seems to get my plants the water they need. 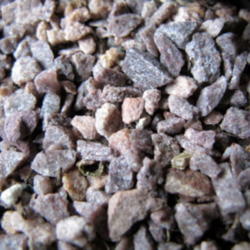 goldfinch4, Wisconsin, zone 4b: I generally use Miracle-Gro potting mix (not potting soil) amended with perlite and chicken grit. I use 4 parts MG potting mix, 3/4 part perlite and 1 part chicken grit. Most of my containers aren’t in full sun. I use mostly hypertufa containers and my sempervivums are very happy in them. Hypertufa and sempervivums seem to have been made for each other. Hypertufa is very porous and allows for the required drainage. I like the organic look of hypertufa with these plants too. One of the fun things about hypertufa is that you can pretty much make it any shape that you want. 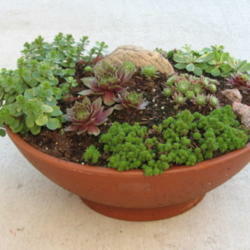 Terra cotta is another porous type of container that works well with sempervivum. Terra cotta is molded and baked clay, generally left unglazed. It comes shaped as flower pots, strawberry pots, dishes, animals, etc. You’re sure to find something you like. 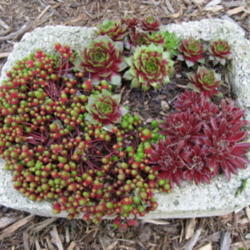 Sempervivums can be planted with many other succulents and alpine plants. The combinations are infinite and so much fun to put together! 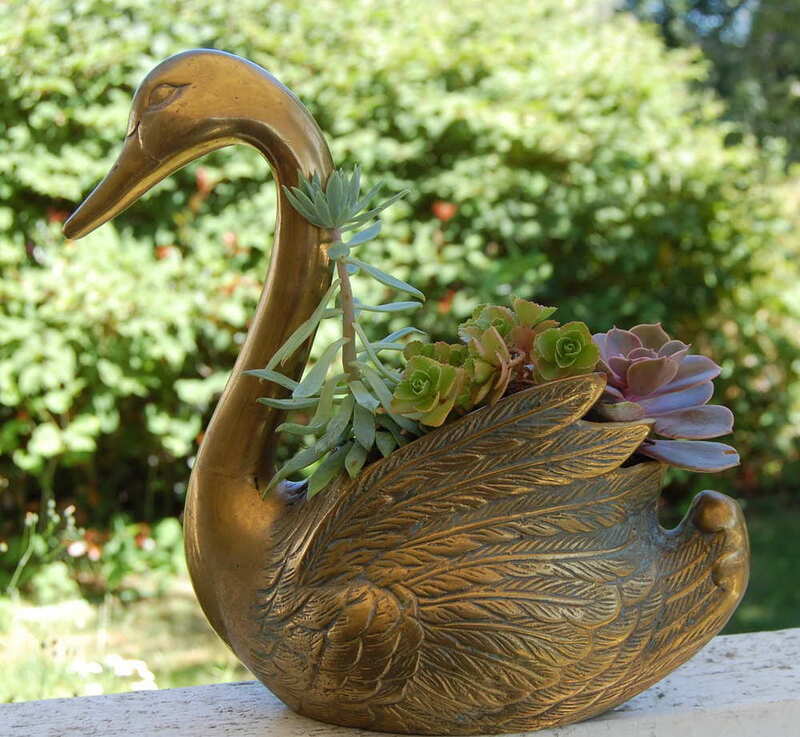 Feel free to add a little garden art to your pots too. 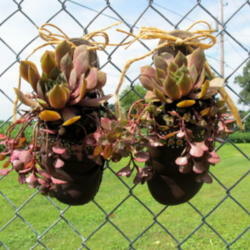 Rocks, sticks, marbles, mirrors, critters, and tiny pots all produce an interesting container. As a rule, sempervivums don’t need fertilizer. If I use a container and the plant remains in it for several years, however, I sprinkle a bit of general purpose slow-release fertilizer in the pot in the spring. Alternatively, I water with a weak Miracle-Gro/water fertilizer solution once or twice a year. 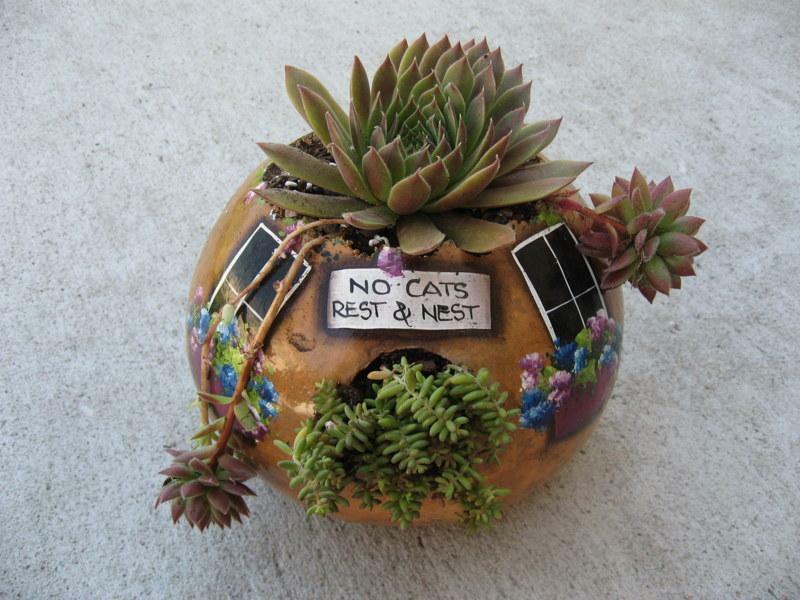 The only pest problem I’ve come across with my sempervivum containers is chipmunks or squirrels digging in them, and the occasional bird stopping by to pull out a plant or pull off a chick. 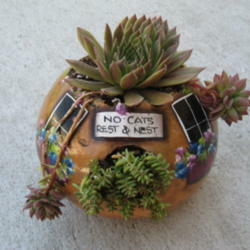 I've found a product called Plantskydd that does a good job of repelling the furry creatures. Birds don't really do much damage, so I try to ignore their interest in my container plantings. 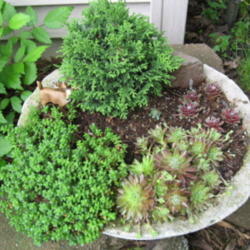 It’s a good idea to use a layer of chicken grit or small gravel as a top dressing in your sempervivum containers. It discourages critters from digging, looks nice, keeps weeds out, and keeps potting mix from splashing on the leaves when it rains. 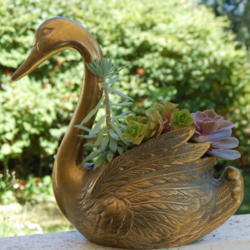 So gather up some fun containers, pick up some pretty sempervivums, and see where your imagination takes you. Bet you can’t make just one!